Do you have a home-based business or hobby that you’re ready to take to the next level? 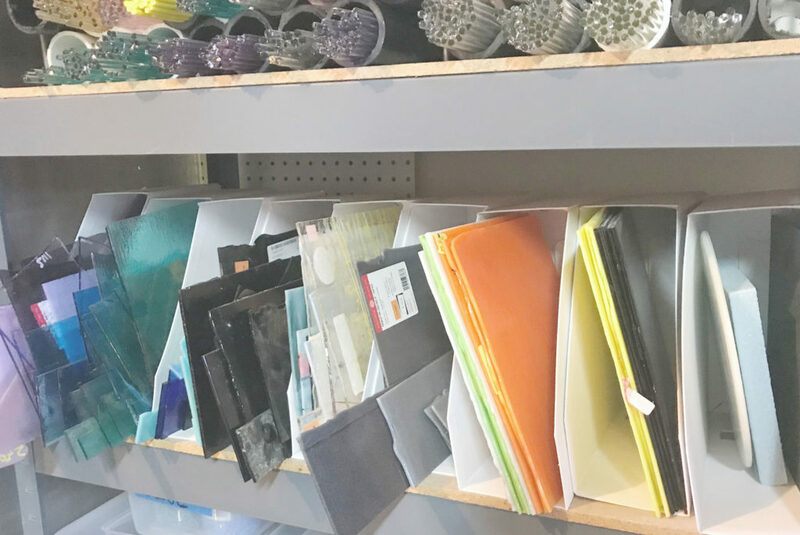 To set yourself up for success, invest time in organizing your business space! 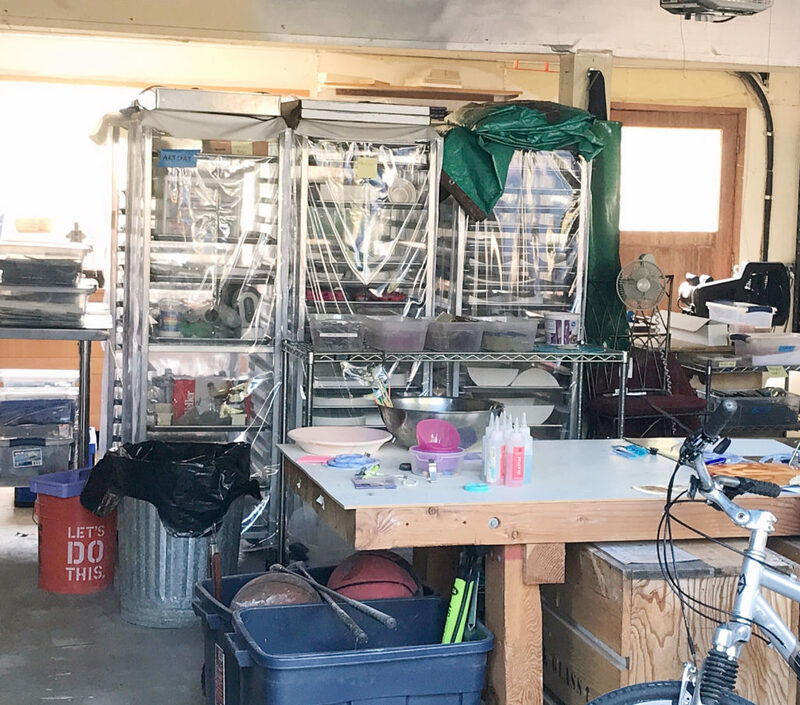 We recently helped our artisan client turn her cluttered garage into an efficient, working space for her glass studio. 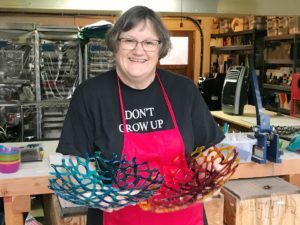 Meet Dorrie – a lifelong creative who was ready to transform her glass-working hobby into a legitimate home-based business. Dorrie started working with glass to help students create special Mother’s Day gifts at a local elementary school. 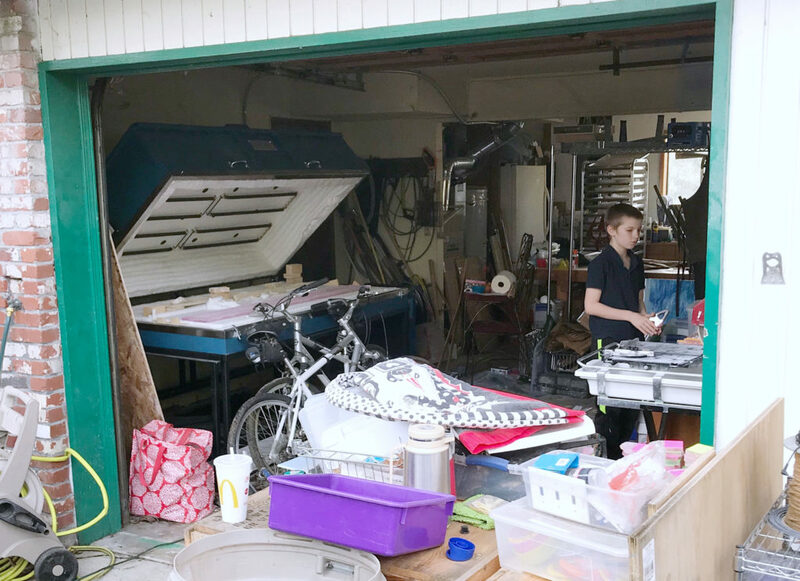 As with many moms, Dorrie’s hobby materials were being buried by family clutter in the garage. 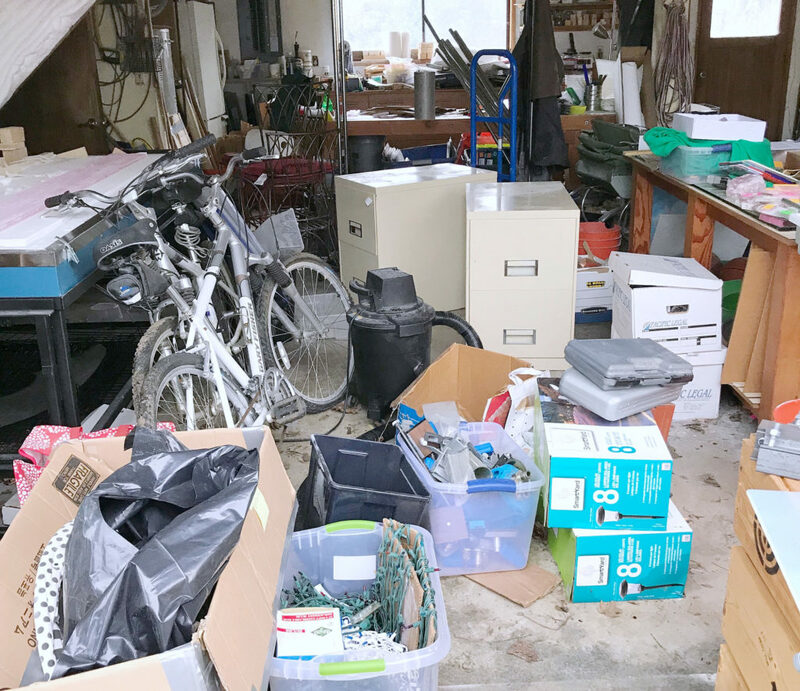 A mixture of kids’ stuff, camping gear, yard care supplies, and even paperwork from her prior career were clogging up the space and making it barely useable. Working on volunteered hours and glass donations, Dorrie’s knowledge and love of glasswork grew through this act of serving her community. Glass is expensive, so she’d been resourceful about finding deals on glass to keep expenses down. 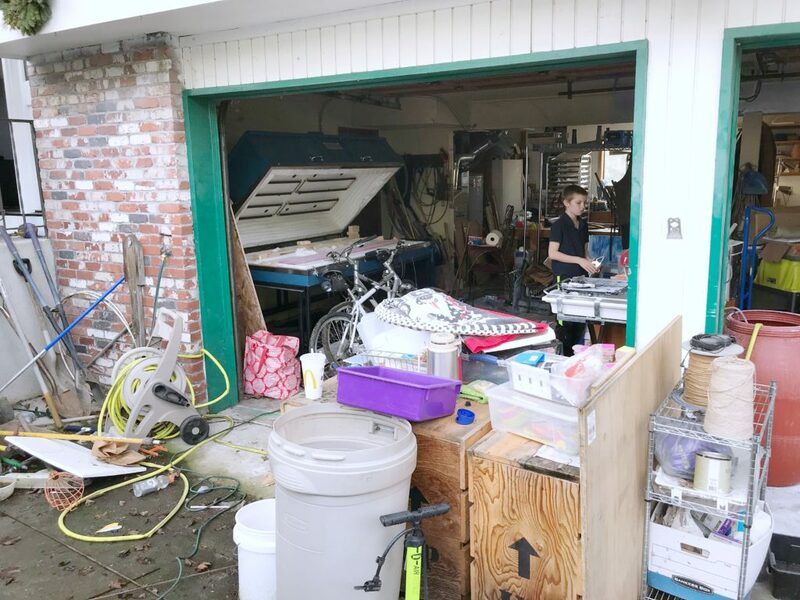 Her resourcefulness, however, meant that more and more glass was being added to her garage without having a good storage system in place. Dorrie had attempted to get the space organized herself with little success. Ready to transform her hobby into a business, she was left frustrated by the inefficiencies of the space. The glass strewn around the garage made finding what she was looking for difficult. A common response to overwhelm is avoidance. Locating glass and supplies took so much effort that Dorrie was overwhelmed. The overwhelm caused her to avoid doing her artwork, often spending her time acquiring materials rather than advancing her artwork. Finally, Dorrie concluded, “If I’m going to get serious about this, I need a good workspace” and she called Restoring Order for help. The first order of business in any organizing project is to assign a purpose to your space. 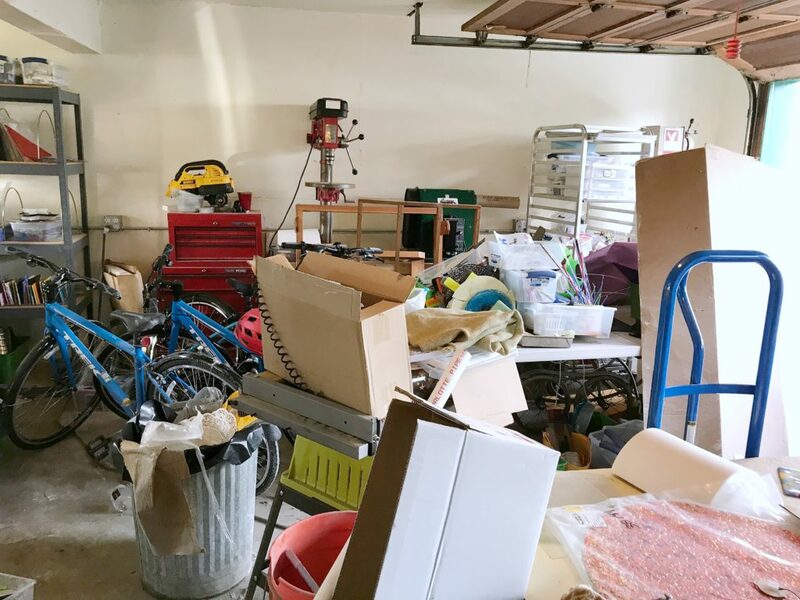 Dorrie wanted the garage to primarily be a glass studio, which meant removing unrelated items to free up space. It was time to deal with the “homeless” stuff and deferred decisions that had landed there. Boxes of old documents were shredded, old furniture and unwanted items were donated, and unrelated items were rehomed. 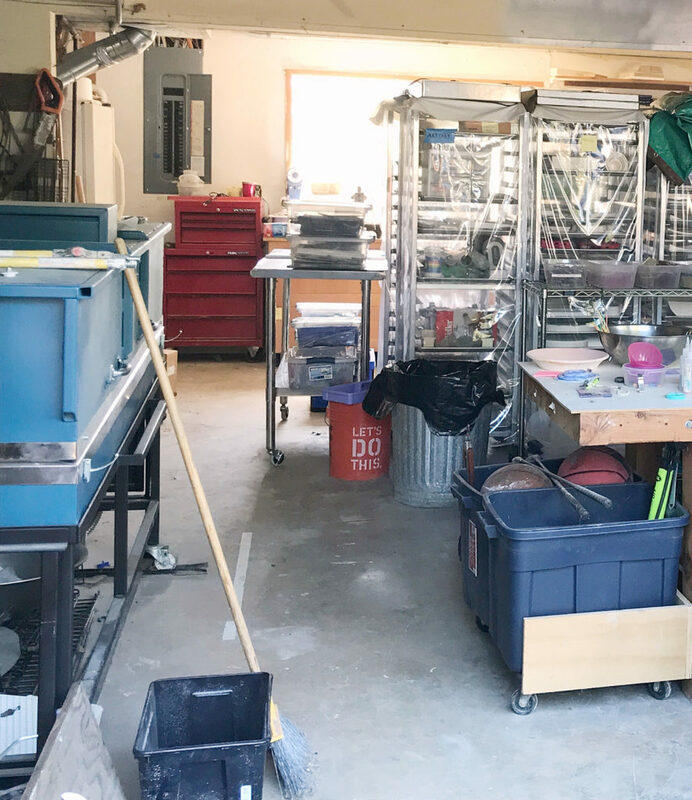 Tackling these postponed “to-dos” quickly freed space in the garage and gave Dorrie and our professional organizer room to dream about her new glass studio. 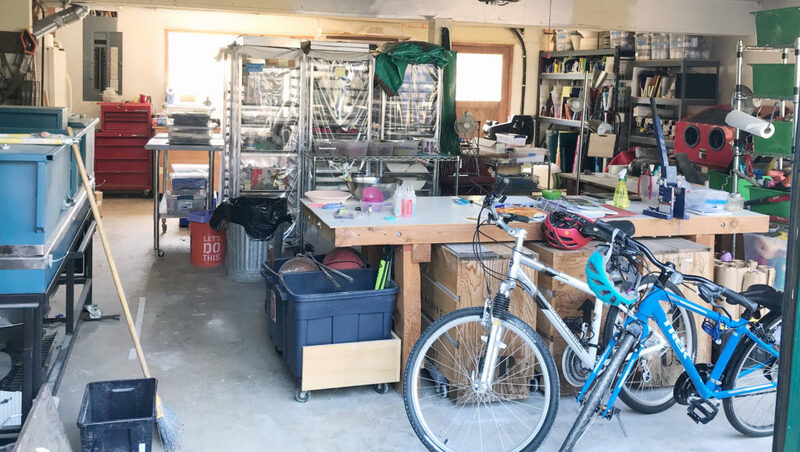 Dorrie had been fitting in materials, equipment, and workspaces among the garage clutter, so they were spread throughout the space. To organize your work space and supplies in a sustainable manner, begin with understanding your processes! 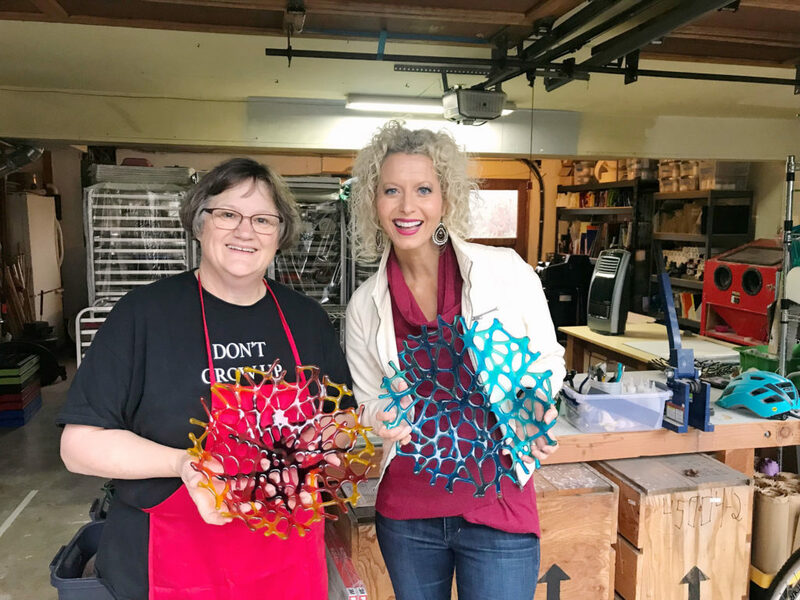 Our professional organizer interviewed Dorrie until she gained an intimate understanding of her glass-making process from beginning to end. This knowledge helped the pair create zones to maximize efficiency in the space. 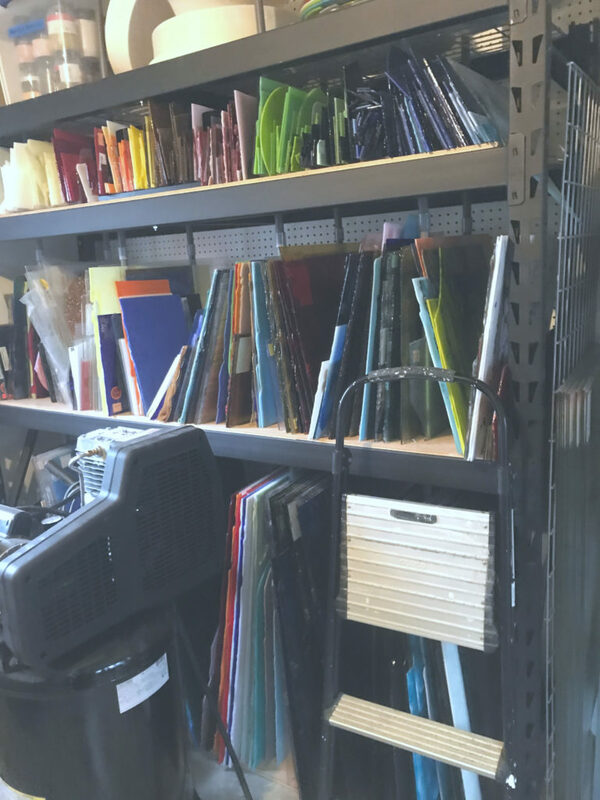 To organize your work space and supplies in a sustainable manner, begin with understanding your processes! 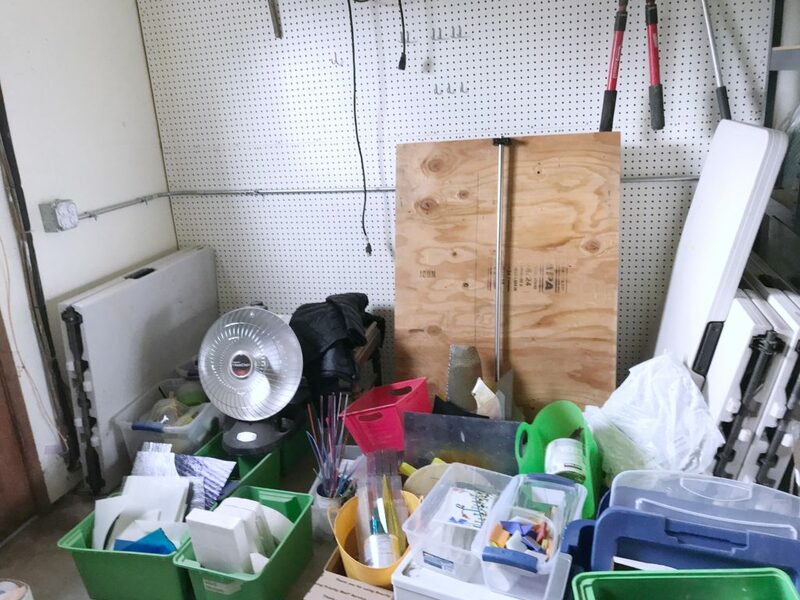 First, all equipment was relocated to one wall of the garage and placed in order of usage. 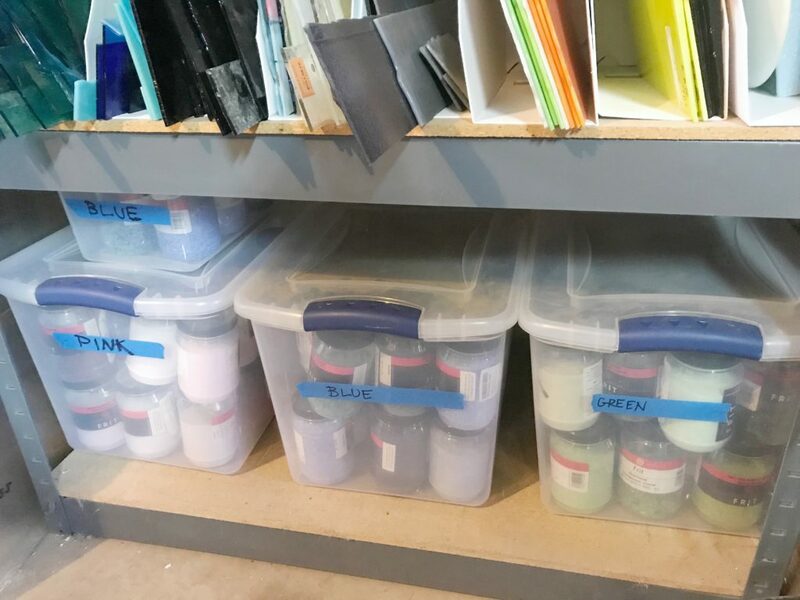 After gathering all the glass from around the garage, our Professional Order Restorer helped Dorrie sort and categorize her materials. Next, they designed storage spaces based on the quantity of each type of item. Larger glass had been stuck in a back corner of the garage, with very limited access. Now, large sheets of glass are stored in industrial shelving. Smaller glass is now sorted by color (a job Dorrie’s kids love being involved in!) so it is easy to find and access. TIP: When organizing a space for your home-based business, involve your family whenever possible! 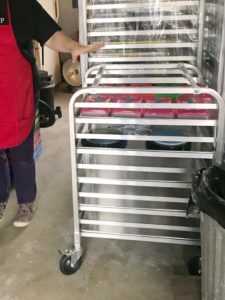 Dorrie had a few food service rolling carts with trays that she used to store her glass-making supplies. However, the carts had become a mishmash of materials and it was difficult to find what she was looking for. Our organizer helped Dorrie assign a theme to each cart, and then microsort items on the individual trays. TIP: To keep storage areas organized, make sure to label contents! Labeling ensures that Dorrie can quickly see what is located on each tray without having to dig. It also reminds Dorrie where to return materials when she’s no longer using them. Without labeling, especially in a large storage project like this, organizing decisions are quickly forgotten and abandoned. Note: the location of the rolling racks in the garage changed as Dorrie used her studio over-time. She and our organizer continued to tweak the system and placement of items until it really worked for Dorrie. In any organizing project, especially workspaces, expect your systems to be tweaked over time as you hone how you use them. The need to adjust is not a sign that you got it wrong the first time. Since organizing is an organic, fluid process, adjusting and refining your systems over time is a sign of increasing order and victory over chaos! In the end, the storage racks were placed in a line in the middle of the garage for easy access and to divide up the space. 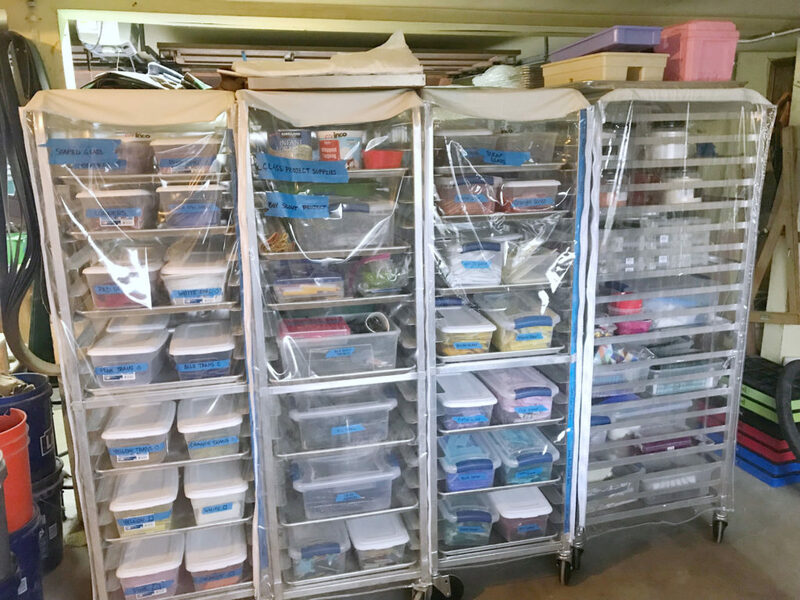 Using storage units to create room divisions is an excellent organizing technique! Once the garage was organized, Dorrie went to work doing her glass creations. She wanted the opportunity to try out the space and experience the flow. What she discovered was that she was still failing to put items away. Luckily for Dorrie, our professional organizers are in it for the LONG HAUL! We don’t swoop in and beautify a space and then leave our clients to fend for themselves. We link arms with our clients and walk through the process with them for as long as it takes. Embracing organizing as a lifestyle – not a one-time event – helps you remain organized! Embracing organizing as a lifestyle – not a one-time event – helps you remain organized! Authentic organizing is an organic process that builds systems around natural habits and tendencies. To create an organizing system that will last, you must understand how the person uses the space. Our organizer used an inquiry method, asking a lot of questions to understand WHY Dorrie wasn’t putting away materials. Authentic organizing is an organic process that builds systems around natural habits and tendencies. Through this questioning we discovered that there were PHASES to each glass project. One previously overlooked phase in Dorrie’s process was the “in-progress” phase where items being worked on could park until the next phase. 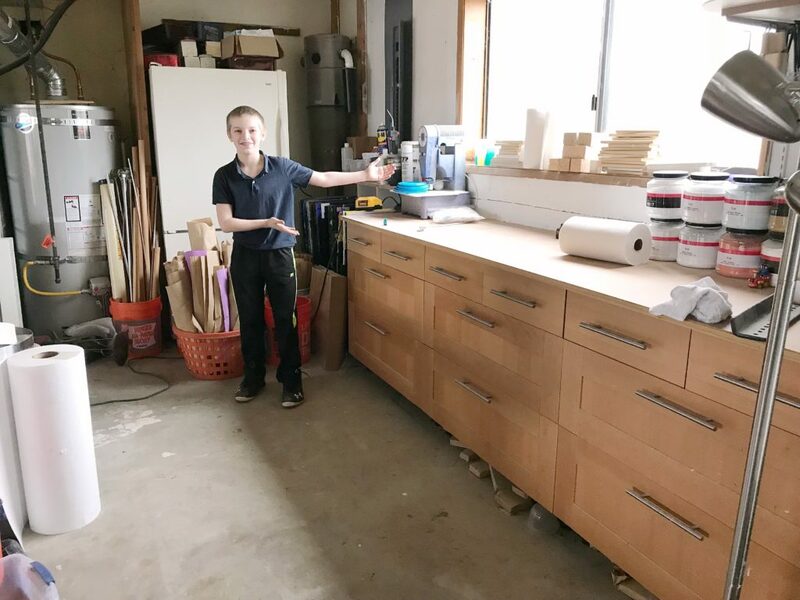 We needed to create storage systems for Dorrie’s in-progress projects. 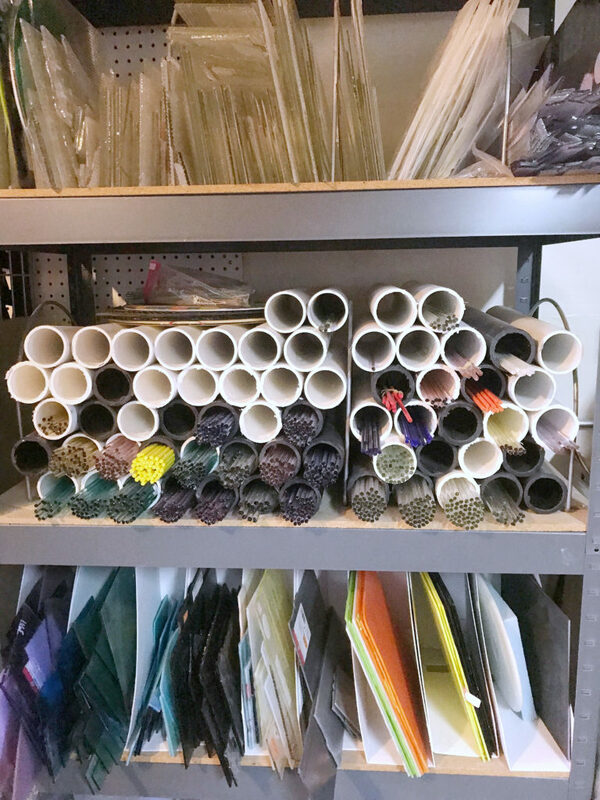 Dorrie purchased two half-sized storage racks for these partially completed projects and now can easily store them until she works on them again. Examining the phases of your recurring work will help you resolve clogs in your workflow. Due to the nature of glasswork, Dorrie needs multiple workstations. 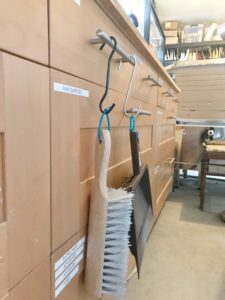 To make cleaning up easy, each workstation is equipped with a hand broom and dust pan, along with its own garbage can and glass recycling can. When we make it quick and simple to tidy up, we are more likely to do so! The transformation of this garage is breathtaking. 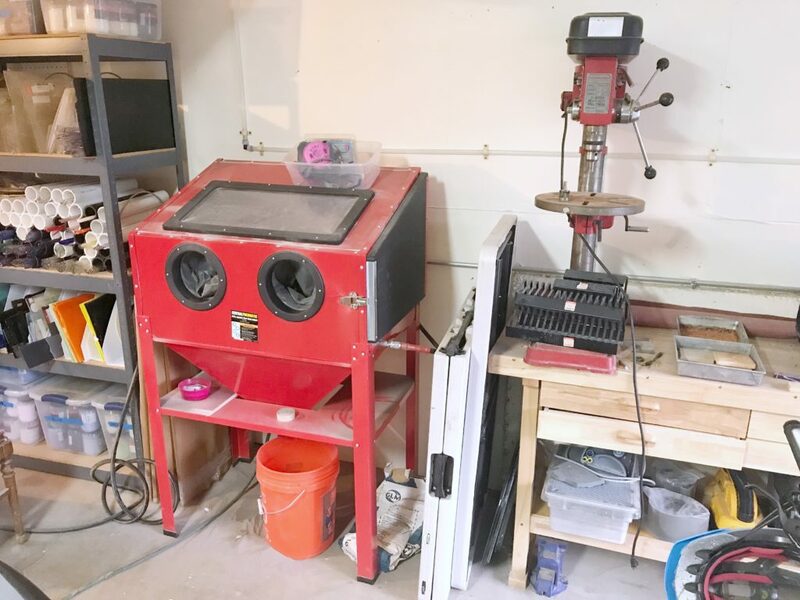 We are thrilled that Dorrie is now equipped to be successful in her new glass studio. If you’re ready to make room in your life and your space for that dream business, we’re here to help! Prioritize organizing your space, examine and support your natural tendencies, and keep tweaking the systems until they truly work for you. 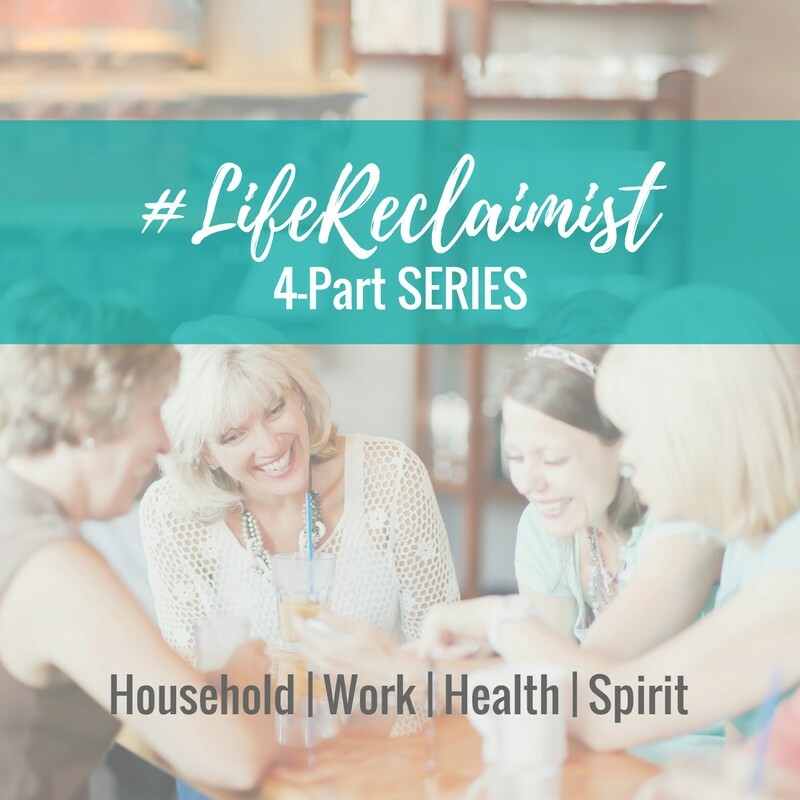 We hope this home-based business organizing project has inspired you to invest in your own dreams!